The style is classic and we all love it! Next I rearranged the rest of her wall decor. Since she still wanted to keep her "baby pop art" prints I made for over her crib when she was born (and I did, too!) I mixed them with two of her round decorations for a new ensemble on a side wall. 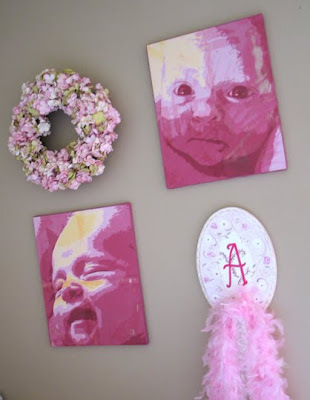 See my tutorial post on how to make your own wall art from your children's photos. So, yes, my daughter's bedroom has builder taupe walls. 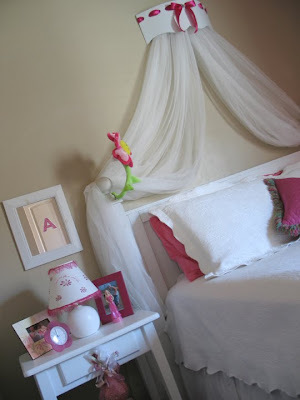 Without re-painting, I combat the color with bold, deep fuschia accents in the decor: wall art, silk curtains, book & toy baskets, sheets, toys etc. She's so excited about her fresh new look and I'm excited to have one new year's goal scratched off my list! I'm absolutely drooling over those pink photos! I love them!!! Thanks for sharing gift idea's with us. Oh I love it! heading to etsy now! That is adorable! My daughter would love it. how fun, a little girl's dream. Love the baby pop art. 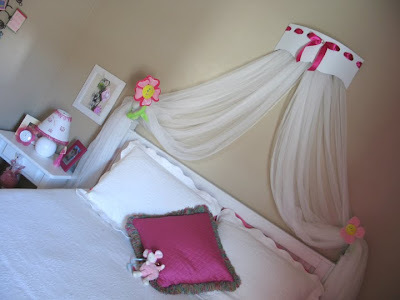 So girly and sweet!